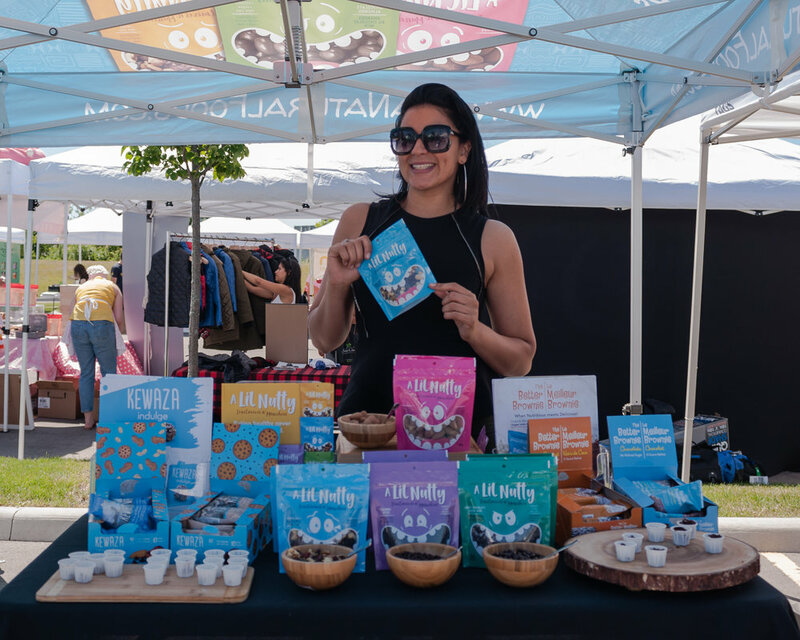 Guests at the July 2018 Vegan Social Event enjoyed delicious food + drinks and eco-friendly shopping at our BIGGEST event yet! Our generous sponsors, including our Stage Sponsor Vegan Stokes Cheese and Venue Partner Organic Garage, helped us make this event FREE for all to attend! This was the biggest Vegan Social Event yet, thanks to all of the wonderful vendors, special guests, attendees, volunteers, photographers, and community organizations who supported us. James Aspey, an Australian Animal Rights Activist who is known for taking a 1-year vow of silence to raise awareness about animal cruelty joined The Sustainable Block Party + Pop-Up Market as keynote speaker. Photo by: LOF Photography. Vendors with sustainable, eco-conscious lifestyle products also joined the event, including Second Season, with pre-loved brand name clothing. Photo by Kristy LaPointe + Plant Based Kristy on Instagram. There was no shortage of vegan eats, including complimentary tasting items! 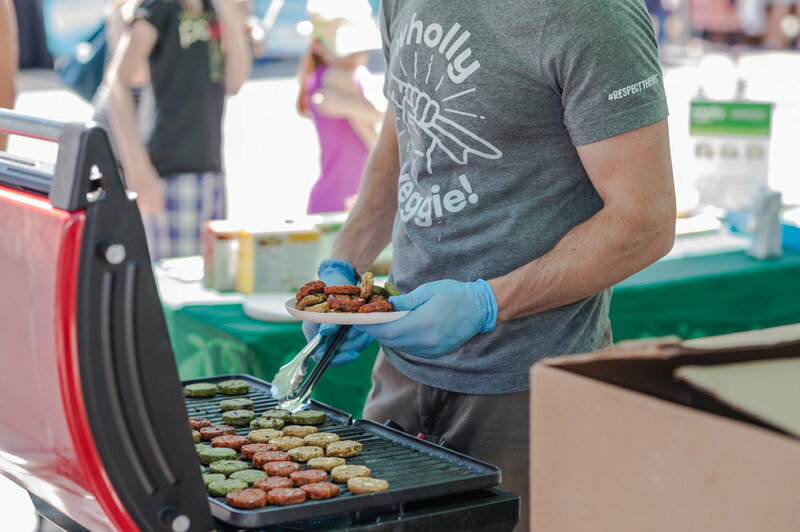 Wholly Veggie sampled a variety of veggie burgers for guests to enjoy. Photo by: LOF Photography. Culcherd joined the event with their delicious dairy-free, organic cashew cheezes, and butterless butter. Photo by: Two Market Girls. Find the full photo album from this event on Facebook. Toronto's Most Sustainable Event Yet! The venue for The Sustainable Block Party + Pop-Up Market was generously donated by Organic Garage. A special thank you to Organic Garage for allowing us to turn the outside space at their Junction store location into a mini-festival space! Organic Garage, a store with a healthy conscience. Photo by Kristy LaPointe + Plant Based Kristy on Instagram. Organic Garage sells the best quality organic and all natural products, including 100% certified organic produce and many vegan options at everyday affordable prices, so customers can shop for Healthier Food For Less! Photo by Rachel Parent. There are many bulk options available at the Organic Garage Junction location, including their newly added bulk spices, teas, oil and vinegar offerings. Photo by Rachel Parent. 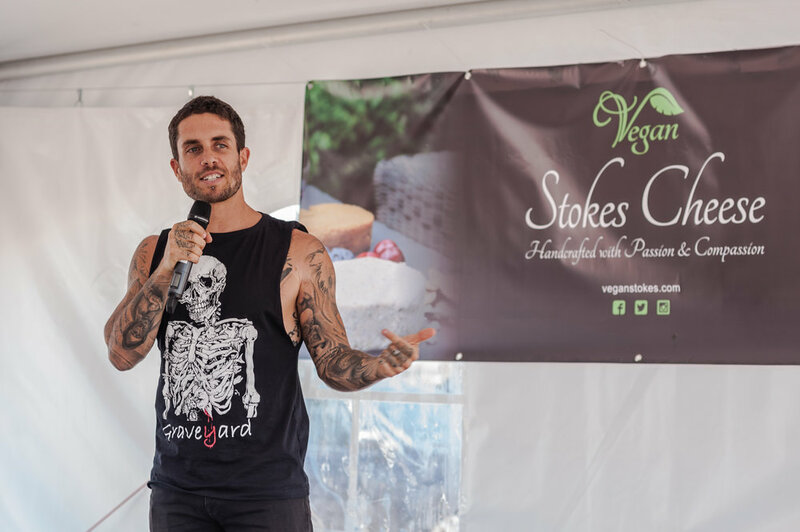 Vegan Social Events was proud to feature special guest speaking engagements and panel discussions, including keynote speaker James Aspey, an Australian Animal Rights Activist and cookbook author, vegan blogger and YouTube creator Sam Turnbull of It Doesn't Taste Like Chicken. We were thrilled to have T.O.A join the Stokes Cheese Stage as our DJ. The Women Who Lift & Shift the World panel included Anne-Marie Campbell of Meat Free Athlete and Shirt Activism, Registered Dietitian and Ph.D. Pamela Fergusson, Holistic Nutritionist, and Naturopathic Medical Student and fitness trainer Tehsina Jaffer. This panel was moderated by the lovely Shoshana Chaim who is a Podcaster and Wellness Coach at Plant Trainers. Our sustainability panel, Live Your Best Sustainable Life, was filled with useful tips and tricks on how to live a more eco-conscious life from panelists including, Vegan Activist Carly Taylor, The Sustainable Duo Carly + Brenden and sustainable fashion designer Aneta Sofronova. Sam Turnbull of It Doesn't Taste Like Chicken moderated the insightful discussions. Watch the panel discussion here on the Plant Trainer's Facebook Page! The Busting Myths panel debunked myths surrounding topics including complete proteins, making gains on a vegan diet and dispelling stereotypes associated with vegans. The panelists who joined us were James Aspey, Richard Burgess Vegan Gains on YouTube, award-winning music producer ZALE and Neil Stokes of Vegan Stokes Cheese. This panel was moderated by Sam Turnbull of It Doesn't Taste Like Chicken. A warm thank you to all of the special guests who joined us at the event. You helped make the day a memorable one! And a BIG thank you to our generous stage sponsor Vegan Stokes Cheese. Sweet treats from Koa Natural Foods! Photo by: LOF Photography. An abundance of dairy-free cheeses from Vegan Stokes Cheese. Photo by: Two Market Girls. 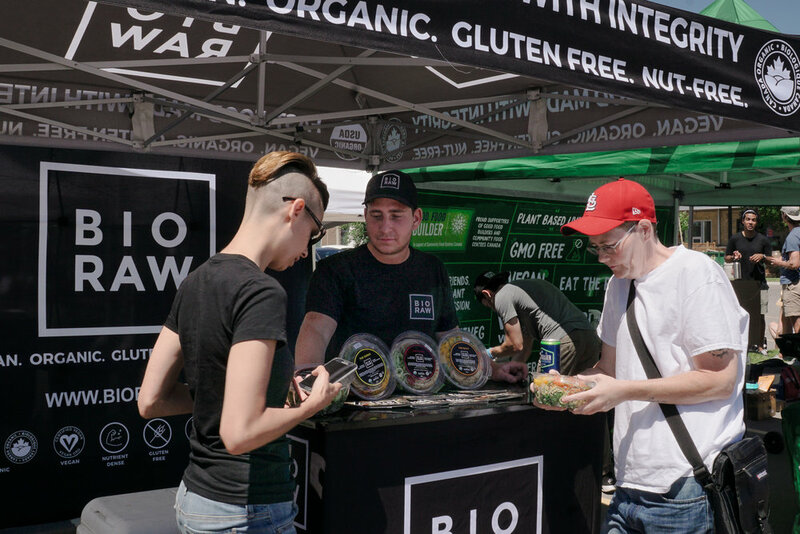 Nutritious, organic meals by BIO RAW. Photo by: Two Market Girls. Refreshing and tasty nice cream from Chimp Treats. Photo by: LOF Photography. Not your average hot dogs from Sausage Party. Photo by: Two Market Girls. Dairy-free ethically sourced chocolate from ChocoSol Traders. Photo by: Two Market Girls. 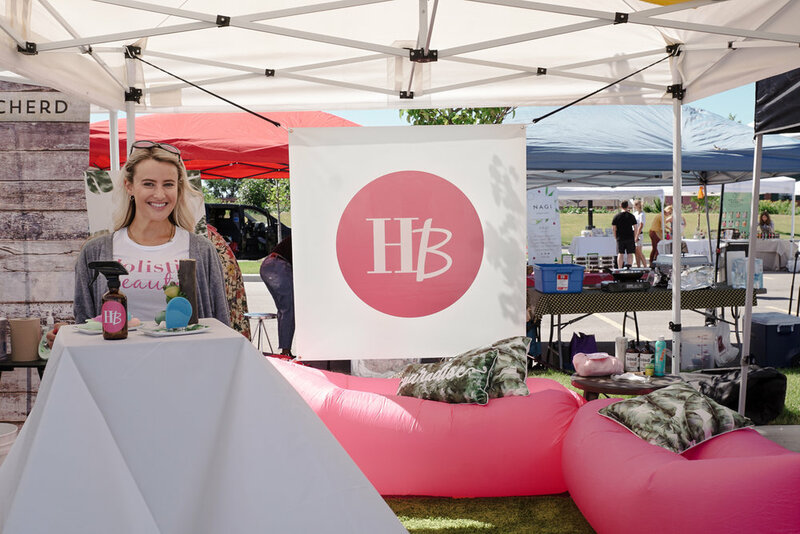 Holistic Beauties set up a mini-pamper station at their booth, featuring their green beauty products. Photo by: Two Market Girls. 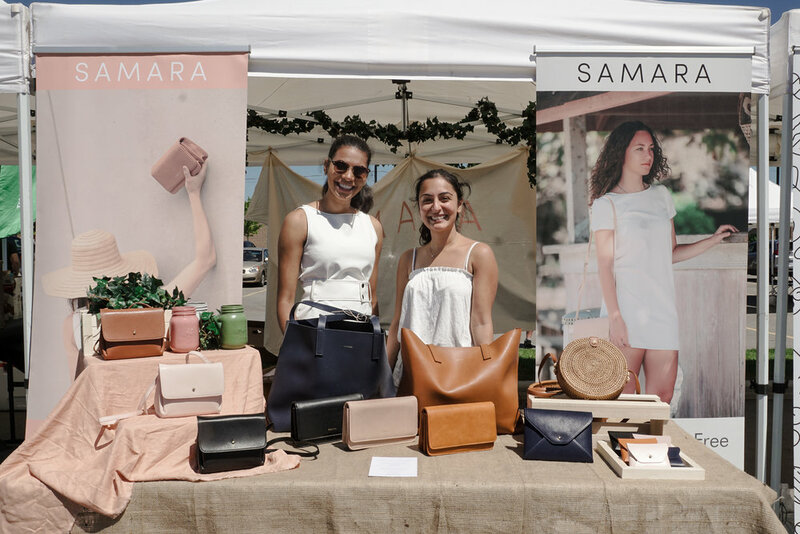 Cruelty-free bags designed for the minimalist by SAMARA BAGS. Photo by: Two Market Girls. Handmade jewelry by Green Eyed Kitty, made with beads from around the world. Photo by: Two Market Girls. Premium animal-free outerwear, ethically Made in Canada by Wuxly Movement. Photo by: Aaron Fisher + The Awakening Self on Instagram. 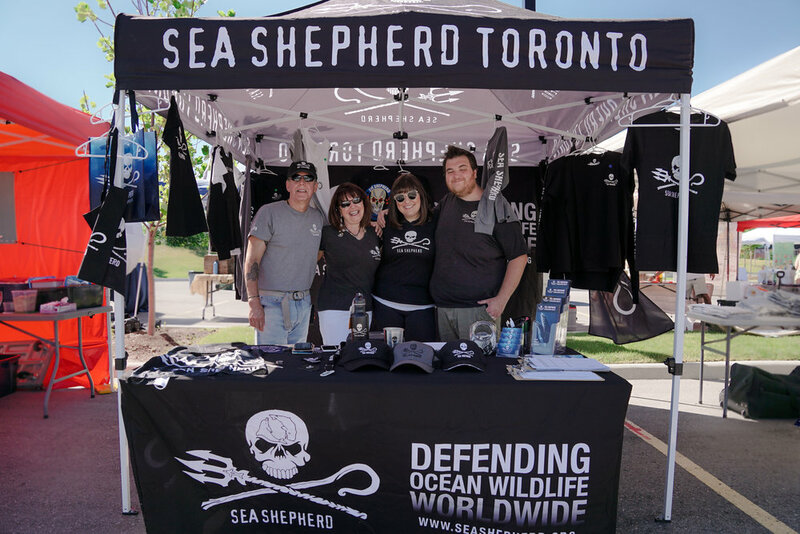 Sea Shepherd Toronto. Photo by: Two Market Girls. Enbridge Gas. Photo by: Two Market Girls. Animal Justice. Photo by: Two Market Girls. Live Green Toronto. Photo by: Aaron Fisher + The Awakening Self on Instagram. We raised close to $1,500 for Tree Canada thanks to the generous support of all of the companies listed below who donated fabulous prizes for the silent auction and to all of the community members who participated! Tree Canada is a registered charity proudly dedicated to planting and nurturing trees. For 25 years, the charity has engaged communities, governments, corporations and individuals in the pursuit of a greener and healthier living environment for Canadians. The charity has greened more than 600 schoolyards and planted more than 10,000 edible fruit and nut trees and shrubs in communities all across Canada to help fight urban food insecurity. You can find the full list with descriptions of all of the items that were featured in the Silent Auction on the Event Announcement post here. Special thanks to all of the photographers and videographers who captured the day! Photo highlights have been included in this article and you can view the full album with over 415 photos on Facebook. Please credit the individual photographers (noted in the description of each photo) when sharing and/or using these photos. For tickets click here. Swag Bags guaranteed to the first 80 guests who purchase tickets! Check out our Facebook Event here. Thank you to everyone who helped make this event a success! I love and appreciate all who were involved. It was so inspiring to see so many great people from our vegan community come together for our biggest event yet. Photo by: Aaron Fisher + The Awakening Self on Instagram.